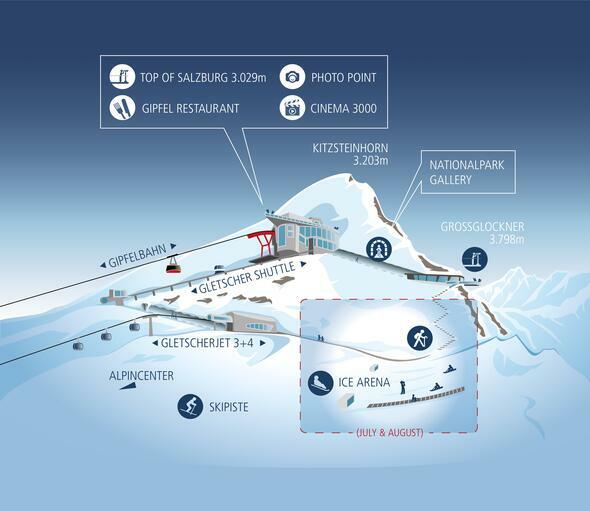 From Kaprun straight up to the Kitzsteinhorn as of winter 2019/20. Opening of MK Maiskogelbahn and Kaprun Center scheduled for December 2018. Kitzsteinhorn Mountainbike Freeride Trails: From the snow to the lake! Freedom at 3.000 Metres - 365 days a year. All-year-round high-alpine experiences at Kitzsteinhorn. Sustainable Environmental and Energy Management. All Kitzsteinhorn photos belonging to the Gletscherbahnen Kaprun AG are copyrighted. Kitzsteinhorn photos are the property of the Gletscherbahnen Kaprun AG and serve to promote the Kitzsteinhorn and Zell am See-Kaprun. These photos may also be used by partners for the same purpose. Commercial advertising projects outside the tourism branch and application by other tourist areas and undertakings are excluded.